Yesterday was a great day! The weather was sunny and perfect for site-seeing. We finally did some of the most touristy stuff in Berlin, and as a result, I got some pretty good pictures. Some of them are posted here! Most of them, however, are stuck on my stoopid memory card*. So we started by taking a big walk down "The Spree," the main and most quaint river in Berlin. We saw people with letters. We saw architectural marvels. 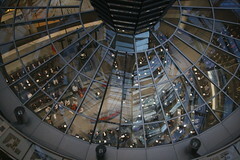 We also spent a ton of time waiting in line to see The Reichstag, the seat of the German government. This is possibly the most touristy thing you can do in Berlin, and appropriately we waiting in line for line an hour. But once we got up there, the views were great. There was even some kind of session going on inside, as you can see from the picture to the right. *Every time I try to copy a bunch of pictures from my camera's memory card to my laptop, I get an annoying "Memory Parity Check Failure," blue screen of death. Arrrrrgh!